Most marketers no longer need convincing that content marketing is a key strategy to engage customers – but too many organizations try to juice returns by generating more content through more channels at faster speeds. Such an approach has no strategic basis whatsoever and is doomed to fail. Why do marketers do it? In part, it’s a tech problem. The options for funneling more content through a greater number of touchpoints increase daily. Cloud-based platforms, dynamic web pages, a wealth of social media channels, and countless other innovations aim to help marketers automate processes and scale their efforts. Just push another button, and better and better tools will make marketing magic happen. But the key question from a content marketing perspective is not how fast, how easily, or how much marketers are able to disseminate; instead, you must ask what kind of content will best connect your brand with your buyers and customers. Content marketing’s fundamental goal isn’t to convey brand information to the organization’s main audiences; it’s to drive specific business outcomes. Any effort to accelerate content that fails to also achieve positive – and measurable – outcomes in sales, revenues, and profits is no strategy at all. More often than not, this crucial nuance is overlooked and so organizations don’t get the full value of their investment in content. According to the 2014 ANNUITAS survey, a mere 2.8% of B2B marketers with enterprise-wide responsibilities are satisfied with the effectiveness of their demand-generation programs. From a content marketer’s perspective, this is a devastating statistic. Demand generation is fueled by content, and since marketing’s ultimate goal is to increase demand for an organization’s products or services, such a high rate of dissatisfaction implies considerable waste in content marketing’s potential value. In fact, Sirius Decisions says 70 to 80% of all marketing content is never used. Understanding how to create content specific to demand generation is the key to augmenting successful content marketing results. It all begins with a documented content marketing strategy. An effective content marketing strategy is built on three core components: buyer insights, content consumption patterns, and content architecture. Failing to integrate any of these three elements into the content marketing strategy will ultimately cause a demand-generation program to fail, and augmenting the wrong tactics will make it fail even faster. Buyer profiling is certainly not new, but understanding behaviors that make a real difference in results is surprisingly lacking. Demographic information and other routine data points are not enough to understand how to be heard above the noise. The real challenge is to develop a deeper understanding of how buyers think, what they need, and what we need to say to get them to choose us. Who are they? What roles do they play in the buying process? What is important to them individually and collectively as a buying committee? What are their pain points, challenges, and buying triggers? Understanding what truly motivates the buyer is by far the most important component in creating a content marketing strategy. How do your buyers get information? Next, you must understand the buyers’ content-consumption patterns. What kind of content do buyers prefer? Where do they consume it and what channels do they use? Only after establishing the buyers’ specific preferences will you be able to amplify the content to generate reliable and predictable results. Understanding the buyers’ purchase path is the final cornerstone in building a strategic blueprint. Aligning content consumption patterns with insights into the buyers’ pain and trigger points provides the framework needed to develop a predictable purchase path. With a clear road map, it’s then possible to create a content architecture to engage, nurture, or convert buyers according to where they are in their own particular buying journeys. 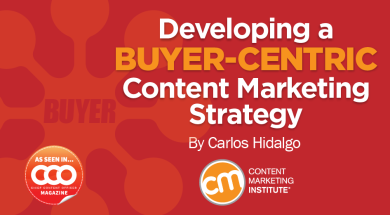 Only after a written content marketing strategy aligns buyer behavior with key stages in the buying process should any content development begin. Amplifying content that doesn’t resonate with buyers in meaningful ways is far more likely to increase marketing costs than it is to generate pipeline and revenue. Strategic content acceleration doesn’t happen in isolation. Integrating content effectively into a demand process requires more than simply aligning content to the buyer. It also requires a strategic alignment with people, process, and technology to ensure the organization as a whole derives greater value from the augmentation initiative. Only then will content marketers be able to validate the program’s ability to increase the number of qualified leads and achieve the company’s broader marketing objectives. In early 2014, the LENOX marketing team began a strategic effort to launch a buyer-centric content marketing strategy. As one of the world’s largest providers of industrial saw blades, LENOX was well-known and entrenched in its markets, and the company’s leadership knew well that its target base was changing the way it consumed relevant content. The change process began with in-depth customer and industry research to identify the personas, pain points, and triggers needed to understand the buyers’ consumption patterns and purchase path. Research showed a serious gap in content designed to nurture potential buyers who weren’t yet ready to convert into qualified leads, and as a result, too many marketing messages were falling on deaf ears. 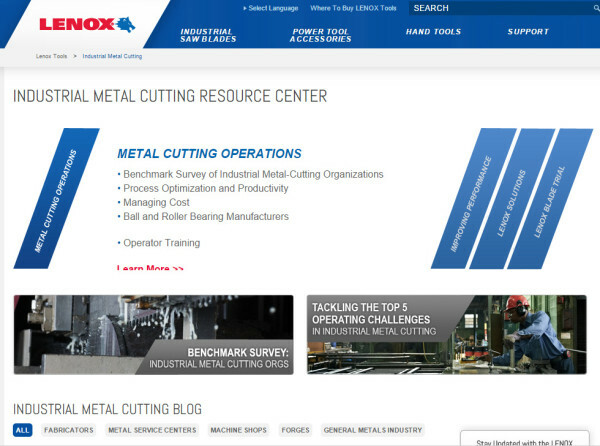 To reach buyers regardless of where they were in the buying process, LENOX created the Industrial Metal Cutting Resource Center. Each section within the center focuses on a stage of the buying process – engagement, nurture, or conversion. Depending on what kind of content the prospects access, LENOX can identify where they are in their buying journey. An ongoing flow of blogs, SEO, PPC, email communications, white papers, and other forms of content generate leads that are given a weighted score. The feedback gives the marketing team what it needs to continue to optimize content. Tactics that lead to better results are augmented; those with lesser impact are minimized or eliminated altogether. Within months, the program began to deliver measurable results. By the end of 2014, LENOX marketing had increased its contribution to the sales pipeline significantly, and by early 2015 the program was consistently converting 11% of engaged leads into qualified leads – up from single digits in pre-program results. At LENOX, the strategy is to accelerate results, not content. This article originally appeared in the October issue of Chief Content Officer. Sign up to receive your free subscription to CMI’s bi-monthly, print magazine. Carlos Hidalgo is the CEO of ANNUITAS and author of Driving Demand. He is an innovative thought-leader with over 20 years’ experience as a B2B marketing practitioner and industry visionary. Carlos is widely recognized for his expertise in strategic integrated marketing, Demand Process, Demand Transformation℠ and marketing automation. Follow him on Twitter @cahidalgo.